He came back with Turtles. Mmm mmm mmm…. I love Turtles! Ha. Now it’s totally in your head. You’re welcome. 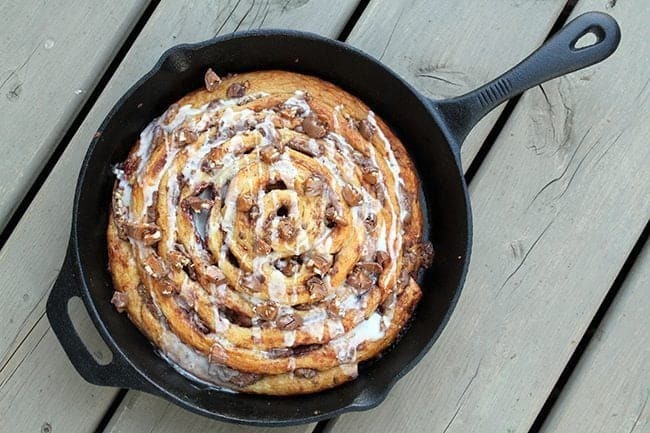 It is SO easy to make a giant cinnamon bun in a skillet folks, I wonder why I have never done this before! You simply take all of the rolls out of the package and link them together, like shown below. You wind and wind the dough around and voila! You end up with this! You can wind in the turtles pieces, or whatever has struck your fancy at the moment. Remember my Oreo cinnamon buns? Let’s just say those would be absolutely amazing as a giant cinnamon bun. I might have to create that next! Oh em gee you guys. I mean, look at this. Yowza. I didn’t want to share.Oh, but I did share and everyone was duly impressed. The kids were salivating over this one before I even made it. While I did make this camping, I made it in the oven, so there is no reason that you can’t make it at home. Heck, it’s even better at home, a nice, quick, easy dessert! 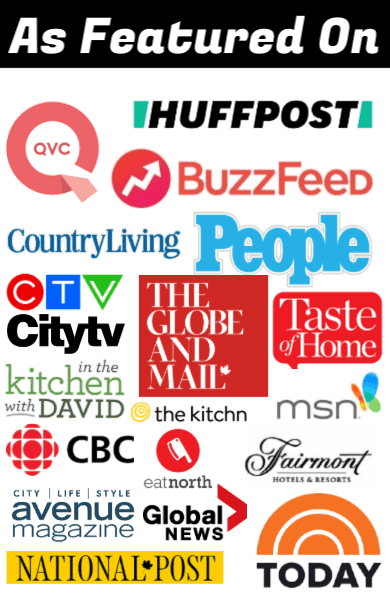 This might just be the wrap up of my camping posts….I don’t think I have many or any left to write! 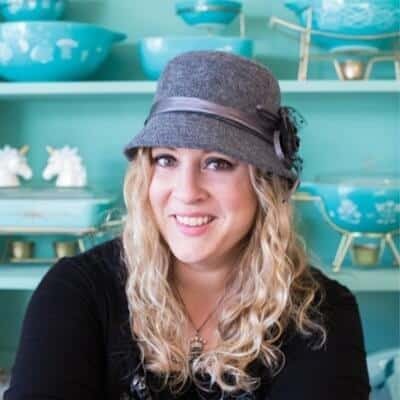 Well, let’s get on to Fall recipes now, shall we? 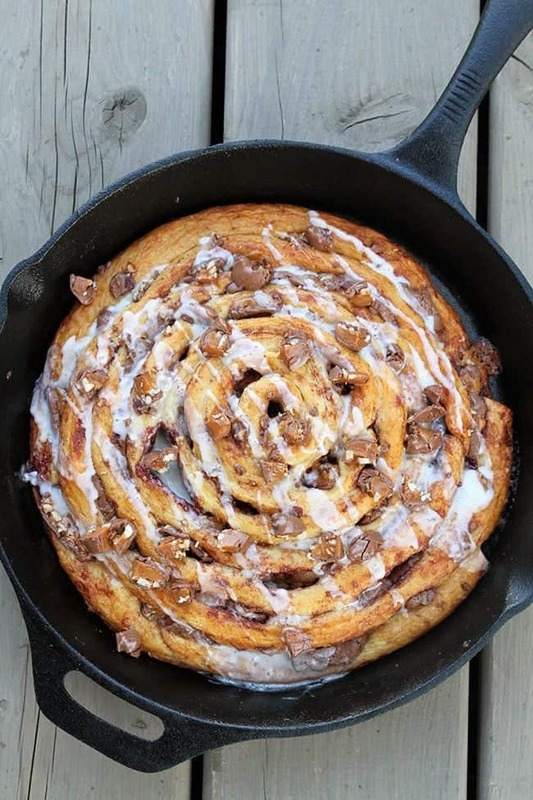 Amazingly easy and delicious TWO ingredient Turtle's Cinnamon bun! You can making this while camping or at home! Pop open the can of cinnamon rolls and remove the rolls and icing. 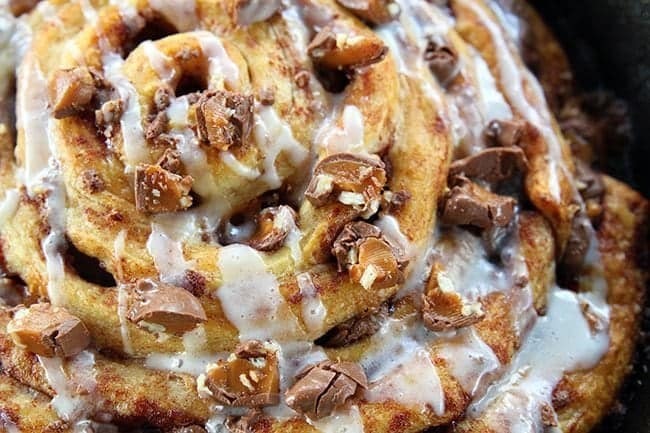 Unroll the first cinnamon bun and place some Turtles on the strip of dough. Re-roll loosely. 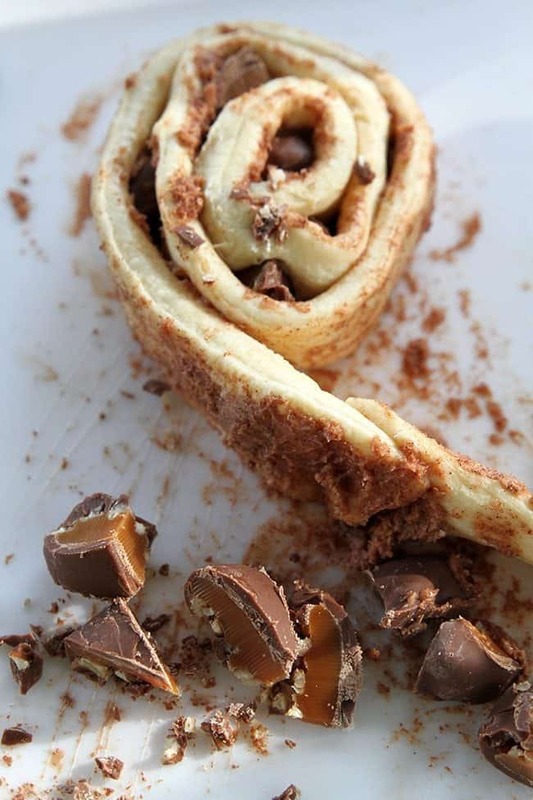 Attach the end of the first cinnamon bun to the end of the second unrolled cinnamon bun, sprinkle Turtles on the second strip of dough and roll around the first cinnamon bun ,creating a larger cinnamon bun. Place this larger bun in the middle of a skillet and repeat the directions, until you have rolled up all 5 cinnamon buns together. Bake in a 350 degree oven until the cinnnamon bun is cooked and browned, anywhere from 20-25 minutes. Cool and ice with the included icing! You can make this cinnamon bun on the campfire as well. Simply cover it with tinfoil and place on the fire grill, making sure that you've chosen a spot that isn't too hot and won't burn the bottom. For the BBQ, light one side. Place the skillet on the OPPOSITE side and cook the uncovered skillet until the cinnamon bun is cooked. Oh my goodness! I can feel my blood sugar going up but mannnnn that looks so good! You were so creative thinking to try that. 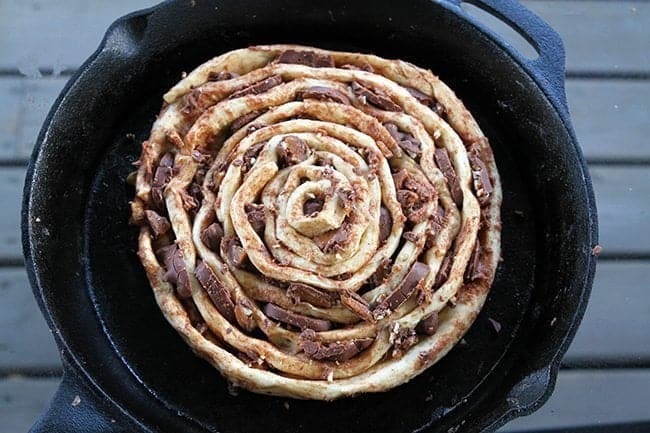 I won’t be camping anytime soon, but the next time I’m at the grocery store I’m going to pick up some cinnamon rolls to try this out on. Maybe if I share it with my roommate on a Saturday morning I won’t feel too bad about all the sugar, haha. 8 or 9 inch skillet and if it’s properly seasoned, then it’s already nicely oiled! I am SO sorry there’s snow! What the heck!! I emailed my dad asking him to get the kids to take the tomatoes out of the garden. This is bull!! Snow this early? Ugh! Will be good on this snowy day in Edmonton!